A story found at the Liberian . Written by Oona Burke, guest columnist; published on 19 June, 2009. The Ministry of Commerce and Industry in collaboration with Geneva based NGO, International Trade Center has recently completed the test phase of “Trade At Hand”, a cell phone based system that helps connect market women to more competitive prices for the goods they buy. The cell phone based system works similarly to posting goods for sale in a newspaper advertisement or online (Craigslist, etc). 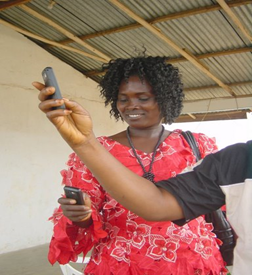 Farmers around Liberia are able to advertise their goods for sale (for example, pepper) and market women on the system are then able to check their phones for all the advertisements of pepper for sale from farmers around the country that day. On the system, market women have access to offers organized by products, and are able to exchange reciprocal offers and match each other’s demands for the sale and purchase of goods. Thus far the test group includes the training of 50 market women across several Monrovia based markets, and 50 farmers in various counties. Market women on the project are extremely excited about the system and are anxious to expand the number of products available to buy. Currently the system includes pepper, okra, bitter ball, cassava, plantain, greens, palm oil /nut, and several others. With some market women on the system reporting that they usually spend as much as $35 a month on scratch cards to communicate with sellers of goods, Trade at Hand, allows market women to also reduce their communication costs by viewing a larger number of offers on their telephones, for a price lower than the cost of one telephone call. Trade at Hand enables market women to carry out their business in a way that increases their chances of accessing better quality and better priced produce. In turn, farmers are also enabled to better off-load their produce, and minimize produce wastage. The system also helps market women develop their price intelligence, because they have access to a variety of prices for the same products. Once the system is tested with the pilot group of market women and farmers, it is hoped that the system can be made available to a larger number of market women and farmers. Trade at Hand is similar to Cell Bazaar, a telephone based buying and selling system in Bangladesh, that currently has 20 million users.